� Killer apps on show from smartwatches, head-mounted displays and other emerging categories. � Will health and fitness tracking remain the primary application in the short run? � What are the emerging new wearables categories? � Are smart garments becoming a competitive reality? � The latest headphones trends including health tracking, sports and wireless. � What competitive trends are on display - prestige brands from the worlds of jewelry and fashion? � Beyond GoPro - the roadmap for wearable cameras and imaging beyond sports and evidential. � Latest TV trends including 8K display availability and content offerings, OLED, curved and bendable. � Complexities in the multi-room audio category. Is incompatibility and fragmentation creating barriers to adoption? How important is the role of services such as Spotify and Deezer? � Smart TV strategies and digital media adaptors, the adoption of Android TV, content deals, features and prices. � Developments in high-resolution audio. � The latest in smarthome control devices and applications for AV, home security and energy management. Linn will be at CES showcasing their Exakt Technology including the ExaktBox electronic crossover, Akurate Exakt speaker/integrated amplifier system, and Kazoo software/APP. Linn's Exakt technology delivers a high quality audio performance and pushes the lossless digital signal path all the way to the speaker. This eliminates sources of noise and distortion that exist in the traditional analogue hi-fi chain. Linn's Exakt turns the loudspeaker into an intelligent, connected, software-upgradeable product. This enables a wide range of performance and personalization enhancing capabilities. Linn's Akurate Exaktbox (pictured above) delivers all the benefits of Exakt technology to your current speakers, and because it's software-upgradeable you can easily upgrade your system in the future as your speakers change. Exakt eliminates magnitude and phase distortion, corrects for drive unit variation, and optimizes your speakers for your room. Akurate Exaktbox contains ten channels of digital-to-analog conversion (DAC), derived from the DAC technology in Akurate DS. This provides all the connections you need to drive any pair of speakers actively, from 2-way up to 5-way. Both balanced XLR and unbalanced RCA analog output connections are included. Lin's Akurate Exaktbox is available in silver or black. Lin's Akurate Exakt System features Exakt Akudorik speakers to deliver great performance in a simple package. The Exakt Akudorik is the first speaker of its kind that integrates Exakt technology into a compact speaker. Comprising Akurate Exakt DSM and Exakt Akudorik speakers, this elegant integrated system aims to outperforms larger and more expensive separates, yet without dominating your room. Linn's Kazoo software offers a host of great features: play music from lossless streaming service TIDAL; browse music by album art in 'tile' view; find music quickly using search; group rooms together and browse classical music by composer. Linn Kazoo is available for iPad, Windows and Mac. YG Acoustics new Carmel 2 speaker ($24,300, Venetian suite 34-309) employs the same reference quality tweeter as used in their highly-regarded Sonja. For midrange/bass sound production, the company's BilletCore 7.25" midbass driver come to the forefront and produces bass down to an impressive 32Hz. Brining a new crossover network was not an easy feat, and they completely redesigned the network to highly optimize the electricals to the drivers and how they interact with the cabinet structure. YG Acoustic's DualCoherent crossover is said to minimizes non-linearity in the frequency, time, and phase domains. YG Acoustics builds every cabinet of the new Carmel 2 in-house using carefully milled, aircraft-grade aluminum billet to ensure a solid, sturdy, non-resonant cabinet design. Internal fasteners aid in eliminating any need for external bolts on a majority of other panels, which gives the YG Acoustic Carmel 2 a sleek, elegant visual style. YG Acoustics have provided the Carmel 2 with a thicker front panel that other designs and delicately curved the front baffle to ensure sound is properly dispersed in a controlled way to the listener. Owners of the Carmel 1 model can contact YG Acoustics to have their drivers and crossover network upgraded to the new 2 status. Specifications are a frequency response deviation of +/-2dB from 32Hz to 40 kHz and +/- 5 degrees from relative phase throughout entire overlap. YG Acoustics' proprietary DualCoherent crossover is at 1.75kHz and employs ToroAir inductors to eliminate cross-talk. Sensitivity is 87dB/W/m and it presents a 4 Ohm impedance (3.5 Ohm minimum). Dimensions are 41" x 9" x13" (HxWxD) and each unit weighs 76 lbs. 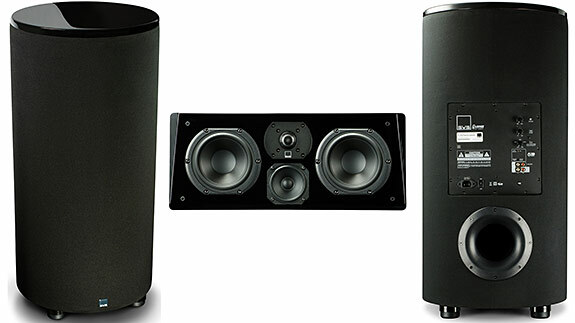 Enjoy the Music.com reviewed the original YG Acoustic Carmel speaker. 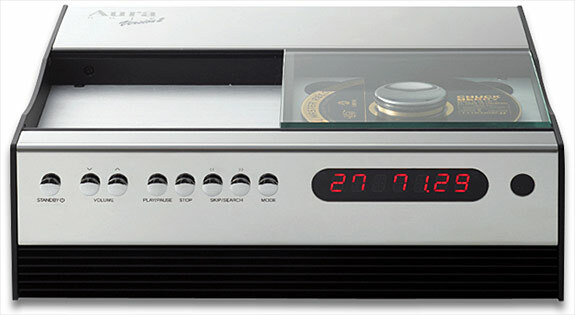 Marantz continues offering high-end AV products and have just announced their AV8802 flagship A/V preamplifier ($3999) which combines balanced audio output plus exclusive Marantz sound innovations with the latest video technologies and connectivity options. The AV8802 features a complex build-quality with a toroidal transformer, a three piece top cover layout, all packed in a heavy copper plated chassis for the best in shielding to keep the signal pure and clean. 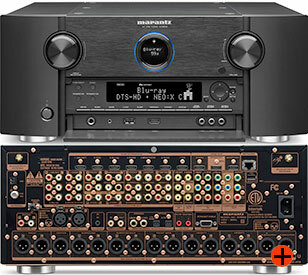 Marantz's AV8802 is an 11.2 channel A/V preamplifier that has high-end audio balanced circuitry and 3D-sound options, including Dolby Atmos and Auro-3D (paid upgrade required). The AV8802 further enhances audio quality by delicately handling all signals via Marantz's HDAM (Hyper Dynamic Amplifier Module) in Current Feedback topology before being passed to the XLR outputs and separate power amplification. Marantz HDAM technology can also be found within their Reference Series components and provides superior low noise wideband performance in an all-discrete configuration as compared to conventional OpAmp ICs. HDAM technology provides an ultra-fast slew rate for true wideband response and high dynamic range to deliver optimum sound quality with today's high resolution audio formats. High-grade audio components include 32-bit/192kHz DAC and a high performance power supply with four hefty 10,000�F capacitors. Thanks to its four DSP (Digital Sound Processing) engines, the AV8802 is capable of playfully handling up to 11.2 channels to fully support Audyssey DSX, DTS Neo:X 11.1, or the new immersive 3D sound formats. For videophiles, the Marantz AV8802 fully supports next generation 4K Ultra HD high resolution video, along with the latest generation HDMI specification including 4K 50/60Hz pass-through and 4:4:4 Pure Color full color resolution sub-sampling. The AV8802 can upscale 1080p content to 4K and also upscale and transcode HD and SD analog video sources. There are eight HDMI inputs including one conveniently located on the front panel, and three HDMI outputs that can drive two different displays in the main room and another HDMI display in the second zone. Built-in Wi-Fi and Bluetooth capabilities provide users with additional music sources, such as Internet Radio, Spotify Connect, Pandora, SiriusXM, and AirPlay. It can play music files stored on a PC or external storage unit via DLNA network streaming standard. Almost any file is possible including MP3, WMA, FLAC HD, ALAC, WAV 192kHz/24-bit and AAC. Gapless, DSD, and AIFF are also supported. Marantz's AV8802 comes with an iPod digital-compatible USB input and a Phono MM input for vinyl fans. The advanced Audyssey MultEQ XT32 (Pro ready) room correction suite adds to the accurate calibration of the speakers whilst Audyssey LFC reduces the transmission of low frequency sound through walls to other rooms. For controlling the preamplifier, a supplied ergonomically-designed remote control in included and the Marantz Remote App (available in iOS and Android versions) lets you operate the AV8802 from your favorite device, such as a smartphone and tablet. 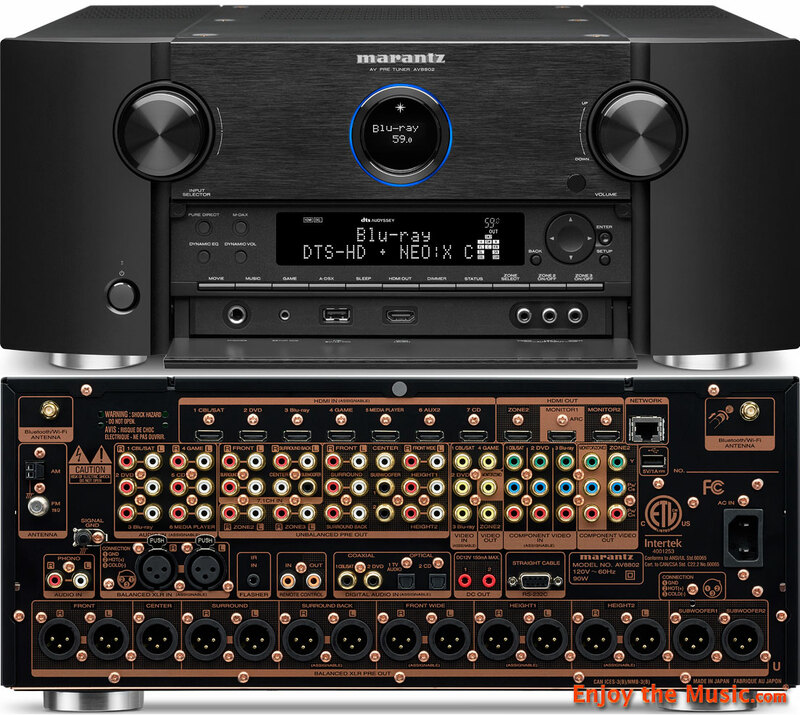 Enjoy the Music.com has reviewed the Marantz SA8003 SACD player, Marantz CD5001 CD player and Marantz SR7008 networked multi-channel receiver. Even after a failed Kickstarter campaign, French company Voxtok is set to launch their multi-room Audio Capsule at the CES 2015 in Las Vegas. 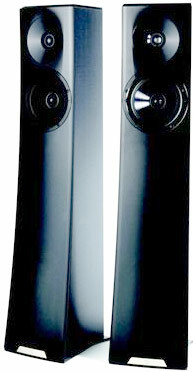 In fact it earned CES' coveted Innovation Awards Honoree for High Performance Home Audio/Video. So what does it do? The Voxtok Audio Capsule is a high-resolution media player and handles files up to 24-bit/192kHz and DSD files. Furthermore, the Voxtok unit is an end-to-end solution that consists of a device, Cloud services and a tablet / mobile APP. Their Kickstarter page says the unit supports most of the lossless and compressed file formats. It's a local player (from the local storage) and a network player (from DLNA-UPnP servers/devices) and based on dual Wolfson WM8741 DAC chipsets. The multi-room server is able to adjust the quality and content format that is playing on the device in real time. It can also rip CDs and provides multiple encoding CD ripping feature and automatically adds the relevant metadata and album artwork. The unit plays back FLAC, Apple Lossless (ALAC), WAV, AIFF, APE, DSD128 (5.6MHz), DSF, DIFF and Dop (DSD over PCM). And yes, it will also play back compressed audio files such as MP3, OGG, and AAC (in M4A container). It is also Airplay-compatible up to 48kHz per Airplay specification. It has Wi-Fi (802.11 b/g/n) and Bluetooth too. The analog stage features audiophile-grade capacitors mated with a very robust power supply. Outputs for analog include both unbalanced RCA and balanced XLR. There is also an HDMI connector for video. SVS will be at the International CES 2015 (Venetian 30-230) announcing their new PC-2000 subwoofer, Prime Series and SB-1000 subwoofer. SVS' PC-2000 subwoofer is a modernization of the original SVS cylinder design featuring driver and amplifier technology from the vaunted 2000 Series subwoofers. Standing 34" tall, the PC-2000 is a striking monolith of power that uses vertical height to achieve a generous enclosure volume, despite the small footprint. Interchangeable black ash or piano gloss top caps give the subwoofer design flexibility to match a range of d�cors. It is also the first SVS subwoofer to come standard with the SoundPath Isolation System. The elastomer feet decouple and isolate the PC-2000 from the floor, resulting in tighter and cleaner sounding bass, less room rattle, and fewer complaints from neighbors and roommates. Inside, the PC-2000 boasts a 12" down-firing 2000-series driver aided by dual high-grade ferrite magnets and an FEA-optimized motor plus STA-500D amplifier (500 Watt continuous, 1100 Watt peak). SVS' PC-200 has a frequency response from 17 Hz to 270 Hz. SVS' Prime Series is a versatile line of high performance speakers designed to give listeners a world class audio experience at an affordable price. Spawned from the acclaimed SVS Ultra Speakers, the Prime Series features d�cor-friendly styling and trickle-down technology that cements SVS as a mainstream high performance audio leader. Consisting of a Tower, Bookshelf, Center and Satellite model, the Prime Series is the American audio brand�s second full-range speaker family offering. SVS applied knowledge gained from developing the award-winning Ultra Series, and also applied exhaustive new engineering and form factor changes to achieve flagship performance at mainstream prices. This design philosophy is illuminated in the premium finish, features, and specifications. The ultimate goal of the Prime Series is to make high-end audio inclusive and open experiences up to a broader audience than was previously possible. The Prime Tower speaker employs a 3.5-way crossover that ensures a full, flat and nearly seamless frequency response from the tweeter to the midrange driver, and through the two individually tuned and isolated 6.5" woofers. Designed for two-channel purists and home theater fans alike, the Prime Bookshelf speaker serves equally well as a standalone reference monitor, surround sound speaker, or front channel speaker, depending on the end user�s preference and the room�s layout. The 6.25" woofer delivers midrange/bass via a stiffened polypropylene cone and refined motor with aluminum shorting ring for reduced distortion. The 1" aluminum dome tweeter utilizes an FEA-optimized diffuser to deliver open 'airy' presentation and unveiled highs. SVS' Prime Surround System includes five Prime Satellite speakers and self-powered SB-1000 subwoofer, all for around $1000. 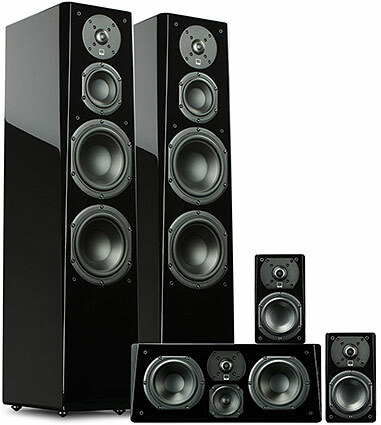 With a rated bandwidth of 69 Hz to 25 kHz (+/-3dB), the performance of the Prime Satellites approaches that of high quality bookshelf speakers. They blend with the SB-1000 subwoofer and together can produce an enveloping soundstage and seamless sonic transitions from front to back and side to side. Despite measuring only 8.75" tall, each Prime Satellite weighs in at a hefty 6.5 lbs. SVS' Satellite speakers also provide flexible installation options and are compact enough to fit nicely in dorm rooms, bedrooms, media rooms or anywhere great sound is desired. Each speaker comes with 3mm elastomer stick-on bumper feet to decouple it from any flat surface. To handle low frequency sounds, SVS' SB-1000 subwoofer is a 13� cube with 12� driver and 300-Watt Sledge amplifier. April Music (Venetian Hotel suite 31-320) will have the new Aura Note Version 2 set up for demos. This audiophile-grade stereo all-in-one music center is a sleek little box with a top-loading CD player, FM tuner, and a built-in B&O ASX250 digital amplifier module that produces 125 Wpc. Following the birth of their original Aura Note 8 years ago, the new Version 2 has the same size and design as the original Aura Note by legendary British designer Kenneth Grange. April Music's Aura Note Version 2 features a top-loading CD player, 125 Wpc B&O ICEpower ASX250 digital amplifier module, FM tuner with 20 presets, and two auxiliary inputs for external analog devices. It also has TosLink optical digital input (24-bit/192kHz), stereo analog preamplifier output and a USB port for use with portable music players (FLAC 96kHz/24-bit, WAV 44.1kHz/16-bit, MP3, and WMA). There is a secondary USB port for use with personal computers (24-bit/192kHz), an iPod/iPad/iPhone digital connection and headphone output. ---> CES 2105 Preview Part 2.